This lively composition clearly references Titian’s famous masterpiece Death of Saint Peter Martyr (1526–30; destroyed by fire in 1867), formerly on the high altar of Santi Giovanni e Paolo in Venice. Calvaert may have known the picture firsthand, or perhaps he worked from one of the early prints after it. While borrowing the general format and some specific poses from Titian’s work, Calvaert created something wholly original. 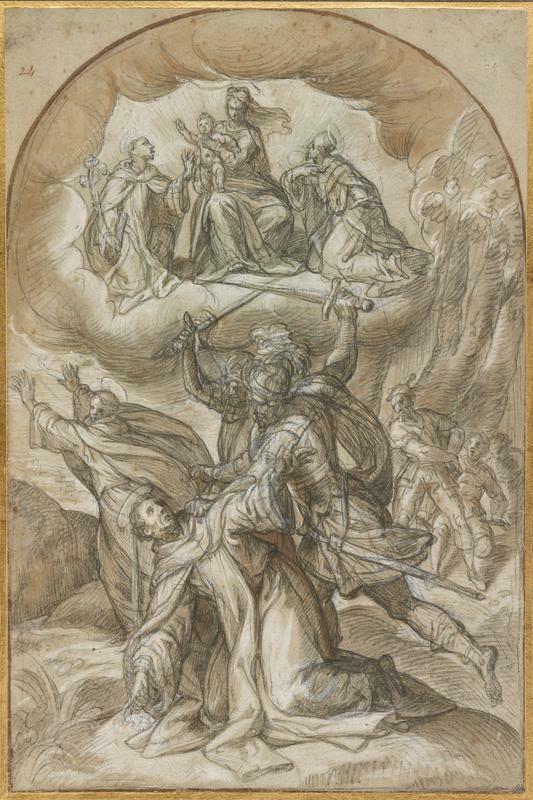 The heavenly apparition that dominates the upper half of the drawing, with the Madonna and Child appearing amid resplendent, swirling clouds, is a signature of Calvaert’s works. He also transformed the heroic violence of Titian’s image into a scene with a dreamy quality, enhanced by the pictorial handling. Calvaert’s figures, with their delicate proportions, abundant drapery, and elegant poses, are more reminiscent of dancers in a ballet than participants in a scene of horrific brutality.